Cell Phone Recycling - for CASH! photo credit: Gaetan Lee Cell phone recycling is becoming more and more critical for our environment. 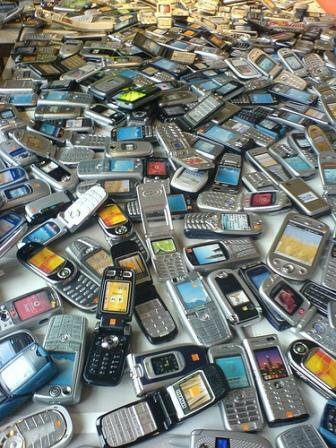 Did you know that well over 130 million cell phones are retired every year, and this number is continuing to grow?! That translates into 350 thousands phones each and every day. That's pretty unbelievable, and doesn't even include other electronic gadgets like tablets, laptops, digital cameras, etc.! Have you considered a cell phone recycling program? Do you have old cell phones lying around your home or office? Do you have old phones that are in reasonably good condition so you've hesitated throwing them out, because, after all, they work just fine and you figure one day you or a friend might want them? If you're like me, you've got old smartphones just sitting around. You upgrade your phone when a new cooler phone comes out for a good price, or a friend or family gives you a new phone as a gift. You're so excited about your new gadget that cell phone recycling doesn't even cross your mind! Many of the phones I have are old enough (or at least not state of the art enough!) that my friends and family aren't interested in using them. So, for the longest time they've just sat around in a box - too good to simply throw in the trash, and too old to appeal to me to use. Or maybe you have old phones that just don't work anymore, and something within you knows that you shouldn't just throw them in the trash. But on the other hand, you never seem to have the time to find a cell phone recycling program. Do a search on their website for the make and model of your cell phone or gadget that you want to sell. Answer a few questions about its condition. It's important to be honest here! Send in your item. They'll provide a prepaid shipping label, and some will even send you a box to use. Upon receipt they'll inspect that the condition matches what you said, and send you the agreed upon payment. Depending on the service, you can expect to have options on how you receive payment. For example, check, PayPal, and sometimes even Amazon gift cards. The great thing is that if it's in working condition, they'll remove all personal data and resell your used cell phone or gadget. Also, items without market value can be sent in and recycled responsibly. It's a win win all around! The most important piece of advice is to check a few of these sites immediately upon having a phone you no longer want. They're constantly changing the prices as new phones come out. I saw a phone I wanted to sell drop from $150 to $75 in a matter of a few weeks (fortunately I sold it at the higher amount!). Some phones aren't worth anything at all if they're just too old. So check the site and act quickly as soon as you're ready to part with it. I was a little hesitant at first, because I was worried that I'd send in my phone and never see the money or phone again. The sites I list on Compare Recycling Services are legitimate companies, so you don't need to have any concern!